You may create links from your web site to articles/information on Two Camera Guys without prior permission. For information on Two Camera Guys editorial awards send your name, company and address to copyright. You may download, reformat and print a limited amount of Two Camera Guys content for your personal, non-commercial use. You may also include excerpts or limited portions of Two Camera Guys information in printed memos, reports and presentations provided that you attribute this information to Two Camera Guys by including "Used with permission from 2CameraGuys.com. Copyright (year) 2CameraGuys.com. All rights reserved." Use of quotes, excerpts or full text of Two Camera Guys reviews, articles, or features. The article is attributed to the appropriate Two Camera Guys author. The article has a visible and active link back to 2CameraGuys.com. The article includes "Used with permission from 2CameraGuys.com. Copyright (year) 2CameraGuys.com. All rights reserved.". Printed versions of Two Camera Guys articles are available for a fee. To request a quote, send us a note to reprints. 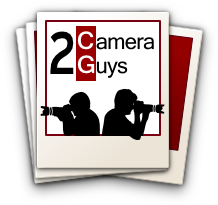 2CameraGuys.com reserves the right to change or discontinue this policy and to request that a site remove its content at any time. Failure to follow Two Camera Guys guidelines will be considered a copyright violation and will be pursued by whatever legal remedies are available.